This topic describes how Pivotal Cloud Foundry (PCF) operators can deploy NFS or SMB volume services. A volume service gives apps access to a persistent filesystem, such as NFS or SMB. By performing the procedures in this topic, operators can add a volume service to the Marketplace that provides an NFS filesystem or an SMB share. Developers can then use the Cloud Foundry Command Line Interface (cf CLI) to create service instances of the volume service and bind them to their apps. For more information, see the Using an External File System (Volume Services) topic. Deploy the test NFS or SMB server bundled with the volume release or you can enable NFS or SMB volume services with the NFS or SMB Broker Errand for Pivotal Application Service (PAS). For more information, see Adding Volume Services to Your Deployment in the Cloud Foundry documentation. Enable this errand during PAS configuration. Click the Pivotal Application Service tile. 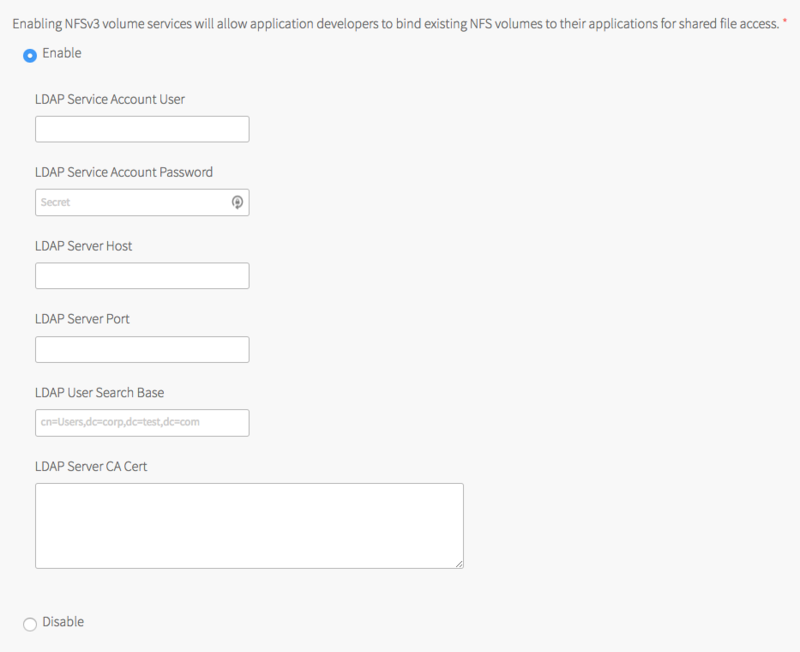 Under Enabling NFS volume services, select Enable. Note: In a clean install, NFS volume services are enabled by default. In an upgrade, NFS volume services match the setting of the previous deployment. Note: If you already use an LDAP server with your network-attached storage (NAS) file server, enter its information below. This ensures that the indentities known to the file server match those checked by the PCF NFS driver. For LDAP Service Account User, enter either the full domain name (DN) for the service account or the username of the service account that manages volume services, depending on how your LDAP server is configured. This value needs to be exactly what you would enter when binding the account to your LDAP server. To limit access to a specific org, use the -o flag, followed by the name of the org where you want to enable access. For more information, see the Access Control topic. (Optional) Enable access to the nfs-legacy service. See NFS Volume Service for details about the differences between the two nfs services. After completing these steps, developers can use the cf CLI to create service instances of the nfs service and bind them to their apps. Application Security Groups (ASGs)—Prevent apps from sending traffic directly to your NFS ports. Apps should never need to use NFS ports directly. Pivotal recommends defining an ASG that blocks direct access to your NFS server IP, especially ports 111 and 2049. For more information on setting up ASGs, see Application Security Groups. LDAP—In addition to ASGs, secures the NFS volume service so that app developers cannot bind to the service using an arbitrary UID. App developers also cannot gain access to sensitive data. With LDAP support enabled, app developers must provide credentials for any user they wish to bind as. The Diego cells running on PCF must be able to reach your LDAP server on the port you use for connections, which are typically 389 or 636. You cannot limit which Diego cells have access to your NFS or LDAP servers. Select the Advanced Features pane. Check the box next to Enable SMB volume services. Set the SMB Broker Errand to On. After completing these steps, developers can use the cf CLI to create service instances of the smb service and bind them to their apps.